Community project officer Stephen Chambers with pupils from Edenside Primary School. 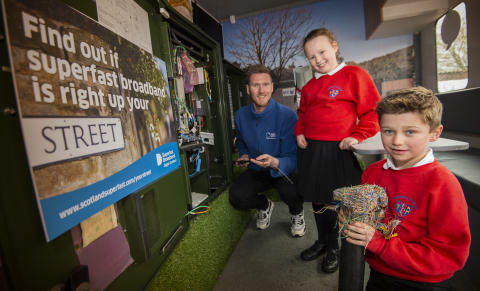 Pupils from Edenside Primary School in Kelso have been learning about technology aboard the Digital Scotland Superfast Broadband Fibre Showcase. The unique vehicle features equipment used in the roll-out of fibre broadband. During the visit, pupils learned about fibre broadband and how it’s delivered through interactive activities. Thanks to the Digital Scotland rollout, more than 36,100 premises across the Scottish Borders are now able to connect to the Digital Scotland Superfast Broadband network, which has now reached Camptown for the first time, with more coverage being rolled out in places like Bonchester Bridge, Duns, West Linton and Leitholm. Work is ongoing, with Openreach engineers continuing work on the ground into 2019. In addition, the latest local properties passed in the Ayton, Coldstream, Jedburgh, Lempitlaw, Stichill and Broughton exchange areas can now connect to the most reliable and fastest residential broadband available, as engineers build more Fibre-to-the-Premises (FTTP) to help harder-to-reach homes join the digital revolution. Sara Budge, Programme Director for Digital Scotland Superfast Broadband, said: "It's fantastic news that the programme has been able to benefit residents and businesses in and around the Scottish Borders. "I would like to thank the pupils from Edenside Primary School for joining us to raise awareness of the availability of superfast broadband in the Borders and it’s really important that the deployment will continue in the area throughout 2018 and into 2019. “The latest upgrades across the Scottish Borders include more deployment of future-proof, ultrafast FTTP, which we’re increasingly using in areas where it’s the best technical solution. Further information is available on Twitter @ScotSuperfast or Facebook at www.facebook.com/scotlandsuperfast.